I always knew I wanted kids someday and Barb also had the desire to have children, but didn’t want to bear them. After being together several years, we started a more serious discussion about having kids and that is when we realized that our own individual desires coincided perfectly and confirmed to us even more that we not only were meant to be a couple, but also parents together. We knew that our first choice was to have a biological child. It is something that I’ve always dreamt of. We were willing to adopt, however, if it turned out that for some reason or another we were not able to have a biological child. Yes, we are both very close with our families so we wanted them to be informed every step of the way to share in both our joys and our disappointments. They were all incredibly supportive throughout the lengthy process. 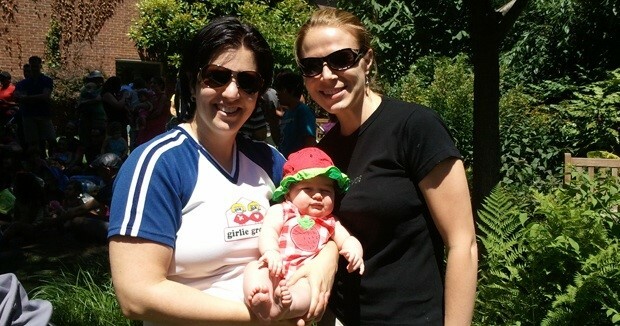 What are some of the challenges you’ve faced raising a child as a lesbian woman? How have you overcome those challenges and what advice would you give new parents in a similar situation? That it might take a long time (three years) but we would get there in the end and know that one day we would have a wonderful baby girl. I know it is impossible to see into the future, but if we had just known that there was a light at the end of the tunnel, it would’ve made those dark times a little less painful. After several rounds of IUI, we moved on to IVF and I finally got pregnant. We had spent so much time, effort and MONEY and were overjoyed that finally it had worked! However, I had a miscarriage 10 weeks into the pregnancy. We were completely devastated and distraught. To add insult to injury, we had made the mistake of telling our good news to all our friends/family, picking out names, etc., only to find out that we lost the baby and had to start all over again, back at square one. The place where we were storing our sperm in deep freeze was a 40-minute drive from the doctor who was assisting with the insemination and there was no transport option other than us going to pick up the thawed sperm and take it to the doctor ourselves. So I’d be in the passenger seat, trying to keep it warm, holding it upright either between my legs or my breasts while my partner drove like a mad woman to get us to the doctor within the window (45-60 min) before the sperm would start to die. She was trying to drive so fast, but at every bump or turn I would be yelling at her that the sperm was going to spill! This wasn’t particularly funny at the time, but looking back on it, this was pretty comical. There were fits and starts and lots of discussions of what to do next throughout the process. We never gave up on the dream of having a child, but we did at points consider various alternatives for having the child, including the possibility of using Barb’s eggs instead of mine (in my body) and adoption. Barb and I had been together almost eight years when we started trying to conceive, so we had been pretty used to life as a couple. We loved each other’s company and were always embarking on new and exciting adventures together. We were very spontaneous and social people, always going out with friends at night and going on weekend getaways on a whim. While trying to conceive, I feel like we (probably more me) became completely consumed with the process. We tried to keep up our “normal” life with friends and activities but the next doctor’s appointment or insemination or IVF appointment or “two week wait” was always on our minds. Because I had a miscarriage in the past, once I did get pregnant, we were so worried that it would happen again that for the first several months, we became all consumed with the pregnancy as well. Now that our daughter is born, we are beginning a new chapter of our lives. We don’t go out at night with friends but we have them over to our house for lunch instead. We might not be able to pick up and go on spontaneous vacations, but we look forward to planning family vacations and including Ava on all of our new endeavors and adventures! We didn’t budget very well specifically for the process of having children. We had some savings complied for the beginning stages, but as the process wore on we made a more concerted effort to save specifically towards making a baby. We even set up a specific account at the virtual bank ING Direct where we could each make deposits – we call the account “baby money” and we still contribute to it – in hopes for baby number two. The total cost to reach a successful pregnancy that resulted in the birth of our daughter was pretty high; I’ve broken it down in pieces. Our first rounds of IUI were fairly low, likely around $500 and sperm storage (of a known donor then) was also fairly low, likely another $500. Some blood tests here and there to see if it worked were another couple hundred (so far total around $1200). Our first IVF attempts were more costly, but in general not too terribly high, with drugs and appointments somewhere around $5000 (total now about $6200). Then there were more blood tests to see if the first pregnancy was progressing, another couple hundred, DNC after miscarriage somewhere around $1000 (total now about $7400). Next there was a round of IVF at a different facility $5000, plus price of anesthesiologist of $500 and drugs of a couple hundred dollars, cost of sperm, storage of sperm and shipping sperm (approximately $2000). ($15,100 new total). For the next set of IVF my insurance provider decided to drop the injectable drugs needed for IVF, so the prices soared. With drugs from Canada, Israel and Turkey, we got the prices as low as $3000 (vice the $5000 from a US pharmacy). Then the IVF and the anesthesiologist were again together about $5500 (new total $23,600). We changed doctors and facilities to the best place ever, but then we needed to rent a zip car for all appointments and morning monitorings, and total zip car fees was somewhere around $500. Shipping more sperm, new IUI procedure, and miscellaneous charges not covered by insurance all totaled about $700. Pregnancy was successful (after almost three years of trying) with a grand total of around $25,000 (and this is probably low because I am forgetting a lot of miscellaneous lab and other fees along the way). Just after my miscarriage we returned to the States and things became a lot better, especially once New York state passed gay marriage, so we were both able to be listed as Ava’s parents on her birth certificate. The doctors, nurses and other staff we worked with at both Columbia Center for Women’s Reproductive Care and at the Fertility Institute of New York and New Jersey Fertility Center (located just across the GW bridge in NJ) were all supportive of the quest for gay families to have bio children. The Fertility Institute of NY and NJ even has a website dedicated to LGBT bio families and how they can help both with insemination and surrogacy. Will you prepare your children to answer questions about their donor/biological parent(s)? We started with Columbia Center for Women’s Reproductive Care but did not have a good experience with them at all. We felt like it was a baby mill where the doctors and nurses didn’t know our name or even remember our faces even though we were there on almost a daily basis! The first thing you do when you enter each time is wait in the billing line to make sure everything is paid upfront before doing anything else, which is a perfect example of how they care about your money more than anything else. We had the complete opposite experience with Fertility Institute of NY and NJ. They are a small office. They greeted us by name every time and never seemed preoccupied with payment. We would stop at the desk on the way OUT of the office to pay (as opposed to it being the first thing you do). While Columbia urged us to go straight to IVF (rather than IUI first saying that since we’d done IUI in the past unsuccessfully we should go straight to IVF), Dr. Navot said “let’s start with IUI since it is cheaper and easier.” It was very individualized treatment and specific to my body and our needs. Well, on our very first IUI try and without using any drugs, I got pregnant and a year later I sit here writing this with my beautiful four-month old daughter on my lap. Don’t give up. Seriously. When we were in the thick of things, so many people told me that “everything would be ok” and I wanted to punch them in the face. What did they know? What if things wouldn’t be ok? So I’m not going to turn around and tell other people that “things will be ok,” because things won’t always turn out as we hope. But the advice I can give is to keep going. Maybe take a break (and maybe save more money) and then try again. And then another break (and maybe change doctors/clinics) and then try again. But keep going. Don’t get stuck in a downward spiral of negativity if things aren’t going well. Try to stay positive and remember there are always other options you can try to make your family happen. Jen is an editor at IC and the spouse of a diplomat. She and her partner and daughter live in the gayborhood of Chelsea and they love it. You can read all of Jen’s posts here.